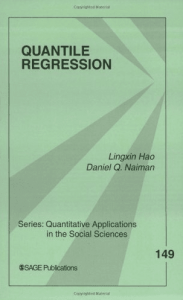 Quantile Regression, the first book of Hao and Naiman’s two-book series, establishes the seldom recognized link between inequality studies and quantile regression models. Though separate methodological literature exists for each subject, the authors seek to explore the natural connections between this increasingly sought-after tool and research topics in the social sciences. Quantile regression as a method does not rely on assumptions as restrictive as those for the classical linear regression; though more traditional models such as least squares linear regression are more widely utilized, Hao and Naiman show, in their application of quantile regression to empirical research, how this model yields a more complete understanding of inequality. Inequality is a perennial concern in the social sciences, and recently there has been much research in health inequality as well. Major software packages have also gradually implemented quantile regression. Quantile Regression will be of interest not only to the traditional social science market but other markets such as the health and public health related disciplines.